I came home today after work, with a determination to make some punjabi food. When I take a peep in the fridge I find nothing but one radish, which I bought few days ago to add it in the Sambhar. And the only dish which striked me was Radish Paratha! Mix the grated radish, ginger, and chopped green chillies, corriander, garam masala and salt. Leave to marinate for sometime. Squeeze well to remove the juice, add this juice while making the chappati dough. Cover the dough with a wet muslin cloth and let it rest for about 30 mins. Beat the yogurt to get smooth consistency. Add salt, grated carrot, and chopped Tomato. Mix well and sprinkle with chat masala on the top. The right recipe for people who run away from Radish. Though it gives a strong odour while peeling and marinating, it tastes and as well smells heaven when the paranthas are ready to eat!! This is my entry for the RCI: Punjabi Cuisine event being hosted by Richa of As Dear as Salt. the stacked muli ka parathas look so good. along with the raita, sounds heavenly. Hey I was about to post mooli ka parathas…what a coincedence really. hey, ur mooli parathey look perfect, YUMMY 🙂 paratha my ever fav, i’m inviting myself over for those! Ekdum perfect, Cinnamon! i love mooli-parathas! I have had mooli paratha only once and it was heavenly. Yours looks fab. parathas look inviting. I have never made any, my mom does. Sharmi, Thanks, it was indeed heavenly. Archana, your icecream was fabulous too! Archana, this my fav meal too! Very creative to make such a fantastic meal out of one radish. Looks great! 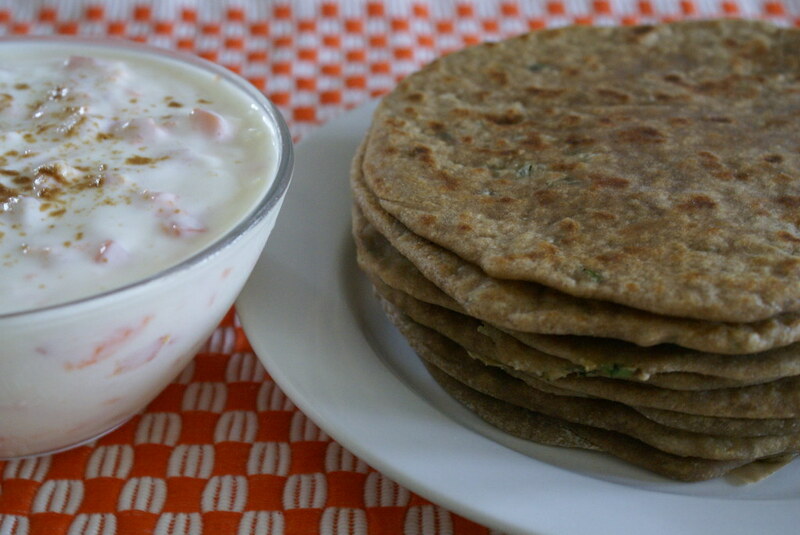 Nice combination…..Mooli paratha with carrot and tomato Raita. We made carrot raita but never use tomato. Thanks for sharing. Looks yummy 🙂 I will try the raita soon. Kajal, Do try with Tomato also, it tastes good!! Isn’t it nice when you can just whip something out of stuff in the fridge? I always have to decide what to make, then make a list and go out to buy everything for every single dish… but I am trying to change now… :). 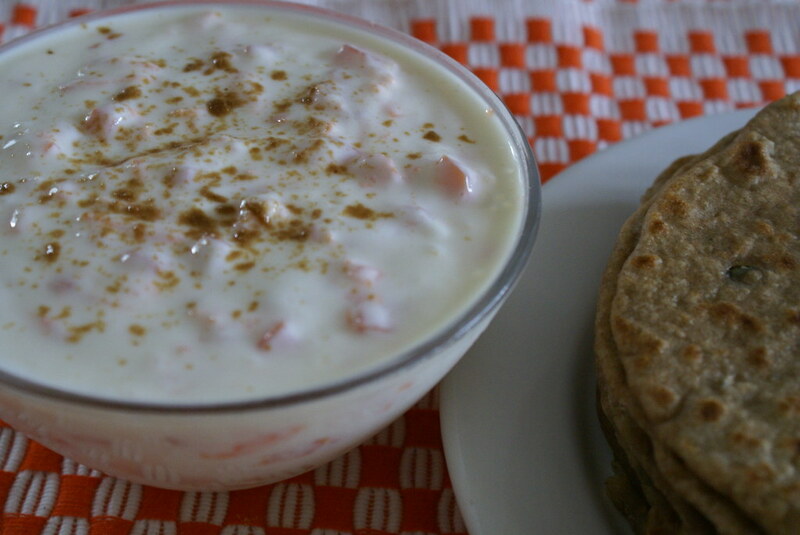 Your paranthas look great, but that raita looks absolutely delicious… so creamy! The raitha is looking so cool. Wan’t to have it right now. Muli parathas looks yuumy. That raita must be great combo for parathas. Thanks for sharing dear. 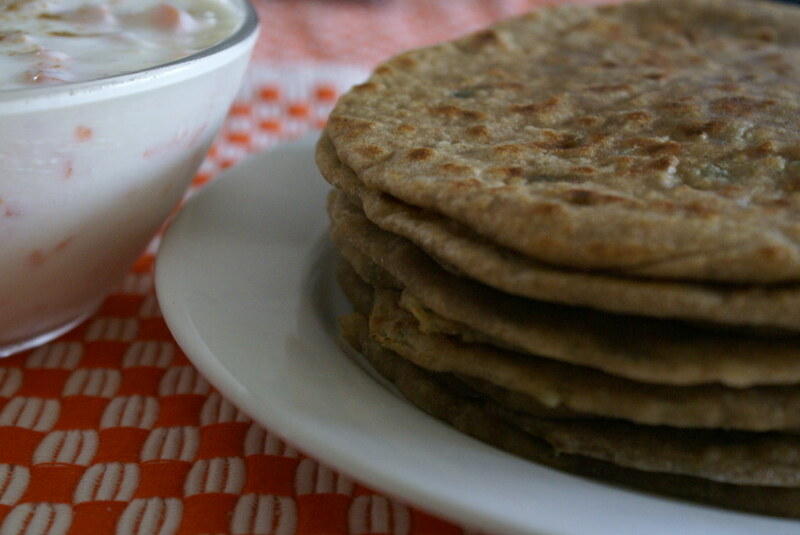 Jyothi, ya parantha and raita always make a great pair !! This is called comfort food.. What more can ya ask for? Cinnamon, Thanx to your comment in my blog that brought me here. Loved your blog very much buddy. Keep up the good work. Your blog is filled with easy and interesting recipes which are all depicted with crystal clear pictures. I will for sure keep visiting you again and again. Your mooli parathas look absolutely divine. It is so true what you said about the odor of radish….once you stuff a paratha with it and cook it, it smells and tastes wonderful. i will have to try mooli paratha made in this manner , definetly will. check out my mooki paratha on the event.